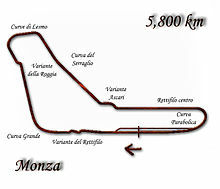 The 1982 Italian Grand Prix was a Formula One motor race held at Monza on 12 September 1982. This was the final pole position, podium, finish, and points for 1978 World Champion Mario Andretti at this race. René Arnoux won the race. Arnoux announced he would be a Ferrari driver the following season. Arnoux finished ahead his Ferrari teammate in 1983 Patrick Tambay, and Mario Andretti in the second Ferrari finished third. John Watson's fourth place put him 9 points behind Keke Rosberg with an outside chance of winning the Drivers' Title at the final race at Caesars Palace, where Ferrari, McLaren, and Renault would battle for the Constructors' Title. ^ "1982 Italian Grand Prix". formula1.com. Archived from the original on 4 November 2014. Retrieved 23 December 2015. ^ a b "Italy 1982 - Championship • STATS F1". www.statsf1.com. Retrieved 18 March 2019.